Abadeh Rug 2'1" x 3'4" Oriental Rug. Type: Abadeh. 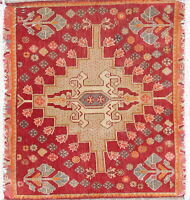 This Persian Rug is Hand Knotted with 100% Wool Pile and Cotton Foundation. These one-of-a-kind rugs are the only types of rugs that we carry. Origin: Persian.